A number of Israeli government websites were taken offline on Wednesday after an alleged wide-scale hacking campaign. The website for the Prime Minister's Office, Finance Ministry, Interior Ministry, and the Israeli Defense Force were among those taken down. The website of the notorious intelligence agency Mossad was also inaccessible on Wednesday afternoon. Israel has been the target of a number of hacks in recent months, including in January when the website of the Tel Aviv stock exchange and Israel's national air carrier were taken offline. The online hacking collective Anonymous has previously threatened to attack Israeli servers for the state's continued oppression of Palestinians, but it could not be confirmed whether they were behind the latest attack. The hacks come a day after a media report alleged that the US and Israel were jointly responsible for a malicious super virus that stole information about Iran's nuclear program. The "Flame" virus was revealed last month, and was reportedly designed to map Iranian computer networks and monitor computers of Iranian officials, the Washington Post said. Cyberwarfare tactics between Iran and the US-Israeli alliance have accelerated in the past year, with Iran claiming to have hacked into a US drone hovering over the eastern part of its territory in December 2011, bringing it down largely intact. WASHINGTON (Reuters) -- The United States and Israel jointly developed the Flame computer virus that collected intelligence to help slow Iran's nuclear program, The Washington Post reported on Tuesday, citing anonymous Western officials. The so-called Flame malware aimed to map Iran's computer networks and monitor computers of Iranian officials, the newspaper said. It was designed to provide intelligence to help in a cyber campaign against Iran's nuclear program, involving the National Security Agency, the CIA and Israel's military, the Post said. The cyber campaign against Iran's nuclear program has included the use of another computer virus called Stuxnet that caused malfunctions in Iran's nuclear enrichment equipment, the newspaper said. Current and former US and Western national security officials confirmed to Reuters that the United States played a role in creating the Flame virus. Since Flame was an intelligence "collection" virus rather than a cyberwarfare program to sabotage computer systems, it required less-stringent US legal and policy review than any US involvement in offensive cyberwarfare efforts, experts told Reuters. Two leading computer security firms -- Kaspersky Lab and Symantec Corp -- have linked some of the software code in the Flame virus to the Stuxnet computer virus, which was widely believed to have been used by the United States and Israel to attack Iran's nuclear program. 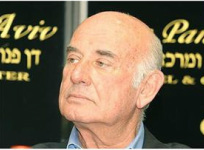 NAZARETH, (PIC)-- Former Shin Bet chief Yaakov Perry warned that a third Palestinian intifada (uprising) may happen as the peace talks with the Palestinian authority always reach a deadlock. According to the 1948 Arabs website, Perry believes that the PA is falling apart, and cannot keep suppressing the uprising of its people for a long time. The Shin Bet chief also criticized the Israeli government, saying it lacks strong leaders who are able to address Israel's challenges. Among these challenges, he stated, is the establishment of a binational state that will kill the Jewish dream of a greater Israel. The Palestinian Authority (PA) should not criminally prosecute Yusuf al-Shayeb, a journalist detained without charge on March 26, 2012, and released on April 2, Human Rights Watch said today. He is being investigated for libeling PA officials whom he accused of spying and corruption. The PA should also release Palestinians detained without charge for criticizing the PA on their Facebook pages. Israeli authorities should not prosecute Adel Rweished, an administrator at Al Quds University whom Israeli police detained on April 2, 2012 during a raid on the university’s media center in Jerusalem’s old city. Police broke up an event marking the launch of a new website, and also arrested a security guard. They released both men but summoned them for further questioning. The arrests were based on an Israeli order stating that the Palestinian Authority had organized the event, but Israeli officials provided no evidence to support that claim, which university officials denied. Israel does not allow the Palestinian Authority to operate politically in Jerusalem. It was the second Israeli raid on media programs at Al Quds University since February 29. On March 28, the Ramallah court of first instance ordered al-Shayeb’s detention for 15 days, to enable police to investigate claims that he committed slander and defamation. Al-Shayeb has refused Palestinian prosecutors’ demands to identify his sources, his lawyer told Human Rights Watch. Whether or not the statements in al-Shayeb’s article were truthful or libelous, criminalization of the libeling of government officials violates free speech norms, Human Rights Watch said. On January 30, al-Ghad al-‘Urdani, a Jordanian newspaper, published an article in which al-Shayeb accused the Palestinian diplomatic mission’s deputy ambassador in Paris, Safwat Ibraghit, of corruption and spying on Muslim associations abroad and passing the information to Palestinian and foreign security agencies. The article also accused Hael al-Fahoum, the Palestinian ambassador in Paris, Ramzi Khoury, president of the Palestinian National Fund, and Foreign Minister Riyad al-Malki, of complicity with Ibraghit and nepotism. “He says the interrogators are pressuring him to reveal his sources, but he has refused,” Dahoud Darawi, al-Shayeb’s lawyer, told Human Rights Watch. Darawi said that the General Intelligence Service, a Palestinian Authority security agency, had detained al-Shayeb shortly after the article was published and questioned him about it for seven hours. Darawi said Palestinian police in Ramallah summoned al-Shayeb again on March 26, after al-Malki and al-Fahoum complained to the Palestinian attorney general. Al-Shayeb has since been detained in Ramallah’s central prison, said Darawi and Yassir al-Salah, a lawyer who advises the Palestinian Journalists Syndicate. The authorities are investigating al-Shayeb, 37, for allegedly violating Articles 189 and 191 of the Jordanian Penal Code, which is part of the penal legislation the Palestinian Authority applies in the West Bank. Article 191 of the Penal Code provides criminal penalties of up to two years in prison for “slandering” government officials. 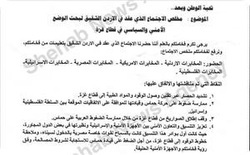 Al-Fahoum, Ibraghit, and Khoury have filed a complaint seeking US $6 million in damages against al-Shayeb for libel in print media, as defined by Article 189. On March 28 al-Shayeb went on a hunger strike to protest his detention, Darawi said, and the Journalists Syndicate held a sit-in to protest the arrest. Al-Shayeb’s wife, Badi’a, said that he worked for al-Ghad for eight years, and that the newspaper fired him after the complaint was filed. Human Rights Watch spoke with her by phone on March 29, while she was trying to visit him in prison. “I haven’t been allowed to visit him yet,” she said. “The guards are claiming that the prison is being renovated.” Since his arrest, she had only been able to see him in court. Al-Shayeb has not been arrested before, she said. On April 2, the first instance court ordered al-Shayeb’s release on bail of 10,000 Jordanian dinars (US$ 14,050). The attorney general appealed the order, but al-Shayeb was released that evening, al-Salah told Human Rights Watch. The Palestinian Press and Publications Law (1995) provides, in article 4(d), that journalists have the right to protect confidential sources of information unless a court decides that revealing the source is needed to maintain security, prevent crime, or promote the interests of justice. Article 7 of the law prohibits publishing material that contradicts the principles of freedom, national responsibility, human rights, and the respect of truth. Article 37 prohibits publishing information that harms national unity. These prohibitions are so vague that they could chill freedom of the press and violate an accused person’s right to defend him or herself, as it is impossible to know what types of information, if published, would constitute a crime, Human Rights Watch said. Because the UN has not recognized it as a state, the Palestinian Authority has not formally signed human rights treaties, but its leaders have repeatedly pledged to uphold the right to freedom of expression. In the second case, Palestinian Authority police arrested Abdul-Khaleq, 37, a university lecturer in journalism at Al Quds University in Abu Dis, near Jerusalem, according to Al-Haq, a Palestinian rights group. Police were investigating Abdul-Khaleq on suspicion of incitement and defamation for posting comments on her Facebook page that allegedly insulted the Palestinian Authority president, Mahmoud Abbas, and for calling for the dissolution of the PA, the Al-Haq director, Shawan Jabarin, told Human Rights Watch. Abdul-Khaleq has not been charged, and is being detained in a PA jail in Beitunia, near Ramallah, in the West Bank. 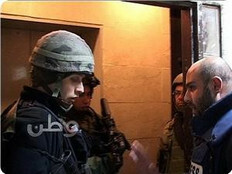 Palestinian Authority police arrested Tareq Khamis, a reporter for Zaman press, in al-Bireh, near Ramallah, on April 1, in connection to Abdul-Khaleq’s case, according to al-Salah, the Journalists’ Syndicate adviser, and a report by the Palestinian Ma’an news agency. He was later released. On April 2, PA police arrested Jamal Hlaihel, for comments critical of the PA that he posted on his Facebook page, al-Saleh said. Israeli authorities have also targeted journalists and university media programs recently. At around 1 p.m. on April 2, Israeli police closed down Al Quds University’s Institute of Modern Media, in the old city of Jerusalem, and arrested the two university employees. The university institute was holding an event for news media to initiate a new website, Hona al-Quds (Jerusalem is Here), focusing on the city. Rasha Alami, who works with the institute, told Human Rights Watch that plain-clothes police “had entered and were chatting in Arabic with the guests for 10 or 15 minutes before suddenly they closed the door and locked some of us inside.” Uniformed riot police were stationed outside. The police presented an order to close the institute, signed by Israel’s minister for internal security, on the basis that the event was prohibited because it had been organized by the Palestinian Authority, which Israel does not allow to operate politically in Jerusalem. The closure order was valid for one day, Alawi said. The police then arrested Rweished, an administrative director, “because he identified himself to police as the one responsible for the event,” Alami said. Police also arrested a security guard, Mohanad Izheman. Izheman was released but was told to report to a police station on April 3. Police detained and questioned Rweished at the “Moskobiya” police station until 9 p.m., Alami said, and was summoned again on April 3. It was not clear whether he would be charged with any offense. Alami and Lucy Nusseibeh, a university director, said the event was organized independently by the university, which registered in Israel as an independent non-profit organization in 1996. The “Hona al-Quds” program had been in the testing phase for three months, and the university had advertised the opening event in advance, but Israel did not communicate any objection or allege that the PA was involved in the program, they said. To Human Rights Watch’s knowledge the PA has not claimed any responsibility for the event. Donors such as the US Agency for International Development (USAID) have supported these stations and vetted them repeatedly, according to public-domain USAID documents. Israel has not returned any of the confiscated equipment or other materials, employees of the two stations told Human Rights Watch. In Gaza Hamas security forces subjected Saher al-Aqraa’, the editor of the al Shoa’lah news website, to cruel and inhuman treatment and torture in detention, according to MADA, an independent Palestinian press rights group. On February 17, Internal Security agency officials arrested him at his home in Gaza, and confiscated his computers, cameras, and various documents, MADA reported. He was taken to the Internal Security compound in Gaza City, where officials questioned him for three days and accused him of collaborating with the Palestinian Authority in the West Bank. When he told his interrogators that one of his legs had been broken, they began to beat that leg. He was not charged with any wrongdoing. In July 2010, Hamas authorities had arbitrarily prevented al-Aqraa’ from traveling from Gaza to Egypt. On March 28, members of Hamas’s armed wing, the al-Qassam Brigades, and Internal Security agency officers arrested a Palestinian cameraman, Sami Abu Salem, of the Wafa news agency, two Swedish journalists, and their driver, in the Tuffah neighborhood east of Gaza City, the journalists told Human Rights Watch. One of the detained journalists, Cecilia Uddan, a radio reporter, said that they had been working on a story about the impact of Israeli border closures on Gaza’s agricultural sector. Security forces arrived on two motorcycles and a white van and arrested them for their presence in a “security zone,” which was not marked, took them briefly to a military site, and then to the Internal Security compound in Gaza City, where they were detained for an hour without being charged. Internal security officials questioned them and confiscated and checked their cameras, identity cards, and computers before returning them. “The Palestinian Authority and Hamas should stop arresting journalists merely for exercising their freedom of expression, and Israel should immediately return the materials it arbitrarily confiscated to the Watan and Al Quds Educational television stations and stop harassing them,” Whitson said. BETHLEHEM (Ma'an) -- The public prosecutor in Ramallah has arrested a woman to investigate a recent post on Facebook, attorney general Ahmad al-Maghni told reporters Sunday. Al-Maghni said Ismat Abdul Khaliq posted a number of insulting comments which accused President Mahmoud Abbas of betrayal and called for disbanding the Palestinian Authority. “Yes to bringing down the traitor Mahmoud Abbas”, “Abbas is the fascist”, and “Abbas has held a party of immorality and shame at the blood of martyrs” were some of the comments, he said. He confirmed the preventive security filed a complaint against her. The Palestinian Journalists Syndicate says Abdul Khaliq is not a member of the union. Palestinians have been arrested for criticizing Abbas and the PA in the past, often after doing so on Facebook. In September 2011, PA forces arrested journalist George Canawati over a Facebook post. After an Israeli media site wrote an article on today's Earth Day March, the comments that followed were filled with slander. 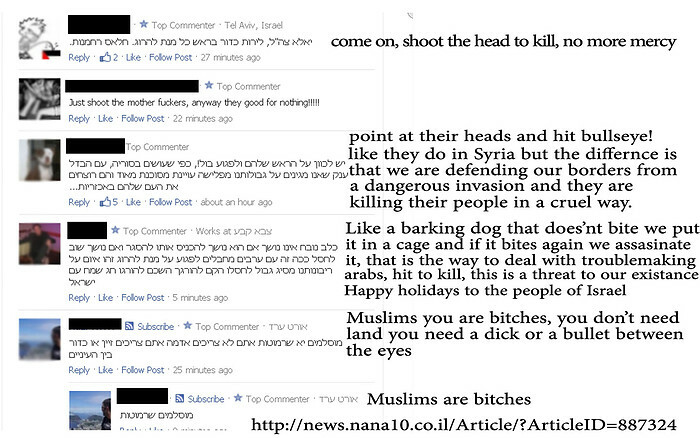 These comments were mostly in Hebrew, and the picture on the right shows exactly what was written. One person wrote (speaking to Israeli soldiers) "point towards their head, and hit the bull's eye", and another added "come on, shoot the head to kill, nomore mercy", other comments are filled with profanity, and can be read in the picture.The Israeli media has not yet removed these comments. This is not the first time that Israelis use social media to slander the actions of Palestinians. A few months ago, outrageous comments were written about Palestinians after an accident of a school bus had taken place, and 10 childern died. Today, 30 March 2012, (Palestinian Land Day), the world will be supporting the Global March to Jerusalem, with actions taking place right across the world. GAZA, (PIC)-- Computer hackers managed to get into the backend of the Shihab news agency website and sent concocted news reports to the subscribers, the news agency said suspecting that the hackers are affiliated with Fatah. Sources at Shihab told PIC correspondent on Tuesday that computer hackers suspected to be affiliated with Fatah broke into their system and sent a message to subscribers denying the truth of the report published one day earlier about a meeting that took place between agents of the Jordanian, Egyptian, PA, Israeli and US intelligence in Amman and agreed on a plan to tighten the siege on Gaza to force Hamas to compromise. The sources said that they believe it was Fatah hackers who were behind this because they want to blur matters to “cover Fatah's crime in conspiring against Gaza." The source added that its engineers are following the matter to secure their servers and confirmed the report that it published on 26 March and the authenticity of the documents published with the report. Look up the video recently posted by PNN, depicting 24-year-old Ahmad Stehwi, being attacked for an alleged 10 minutes by an Israeli police dog during a peaceful march last Friday, and YouTube will inform you that the video is flagged. "This content may contain material flagged by YouTube's user community that may be inappropriate for some users." It will then ask you to sign in and verify that you are at least 18 years of age before allowing you to view the video. Qualquelia region of the West Bank on March 16th, also depicts the arrest of a fellow protester who was trying to aid Ahmad. Palestinian, Israeli and international protesters were present and according to sources, and visible within the video, none were armed in any way. "There are exceptions for some educational, artistic, documentary and scientific content (e.g. health education, documenting human rights issues, etc. ), but only if this is the sole purpose of the video and it is not gratuitously graphic." In the 2009-2010 Iranian election protests, the widespread use of smart phones and personal cameras together with the democratization of publishing photo and video content contributed enormously to global awareness. Despite massive efforts by the Iranian government to censor and curtail internet use, images like that of 26-year-old Iranian Neda, a female shot in the chest and killed by security forces are seared in the collective memory of the country. Neda's shocking and graphic death remains posted in multiple videos on YouTube without any restrictions as a testament to the atrocities committed by Iran's Security Forces. YouTube has not rescinded the flagged status of the recent footage of Ahmad being attacked. It is nearly impossible to report this issue directly to YouTube, as the contact us page has several subcategories but none addressing those that potentially censor evident abuse of human rights. RAMALLAH, (PIC)-- Big numbers of Israeli occupation forces (IOF) and intelligence officers broke into the premises of the Watan TV station and its website in downtown Ramallah at dawn Wednesday. The IOF soldiers detained the four workers present in the premises for a few hours and confiscated its main transmission equipment, all computers, and official papers and documents in the building’s administration. One of the TV staffers said on the Watan TV that the IOF soldiers suddenly stormed the building in a pre-dawn raid and detained all workers present and wreaked havoc on the station and objected to the presence of a photo of Khader Adnan hanged on one of the walls. Adnan, an Islamic Jihad leader, almost died while on hunger strike for 66 days in Israeli jails protesting his illegal administration detention. He ended his strike on the 67th day when an agreement was reached with his lawyer by which he would be freed in April. Palestine News Network editors retweeted @pnnenglish a picture which revealed disturbing comments on facebook.This was an Israeli facebook page that had posted a comment about a school bus accident that had occured in which at least 10 children had been killed and more than 40 injured. But what was shocking wasn't the fact that an accident took place, or the fact that it was a school bus filled with children under the age of 10, or the fact that most of the children didn't die from the crash but instead were burned to death as the bus went into flames, but no this was not what was shocking, what was shocking were the comments written by some Israelis in Hebrew about the subject. Different social media sites had various comments on the subject, one person wrote "relax, these are palestinian children" another wrote "Great! Less Terrorists" and another "I hope everyday there's a bus like this". This was not enough though, there were similar comments left on Prime Minister Netanyahu's page, of which no one apologized. This bashing is shocking, the fact that people write what they truly believe is disturbing. Is this how Israelis feel? or is this a small minority? Nonetheless what has happened to society, when people are relieved that an accident took place, have the Palestinians and Israelis become so separated that they would write such things. But to me these are simply cowards sitting at home, and judging the world with the press of a button. It makes a person wonder, if they were standing right in front of that bus when the accident occurred, would they be shouting "Less Terrorist" or would they be pulling their hair out at the sight of another human being (regardless of their background) frying to death, or the sight of a small girl being burning, and screaming from the excruciating pain. If they were standing right in front of that bus when the accident. Even though the Media will probably not give this story as much attention as it does when Palestinians celebrate the death of Israelis, there is a more powerful tool that's already at work. A tool that does not get paid to work, a tool that is unbiased, and a tool that practices free speech, The Social Media. The same weapon that was used by Egyptians, and other Arabs in their struggle for freedom, and their struggle to show the world the injustice they live in, hopfully will be the same weapon used to help balance the propaganda on the Israeli/Palestinian conflict.I don't ask that Israelis are demonized, but instead I only asks that there is a balance; a balance that is weighed not by how many "Benjamins" you can give your TV broadcaster, but by how many "tweets", and "shares", and "likes" you have. Will social media create a better world? Will Israel be exposed to it's true nature? Will this new form of media help bring a balance to the lopsided conflict? I am optimistic, but for this balance to exist, an enormous effort is required, all our efforts put together, and tweeted at the world in a struggle against injustice.